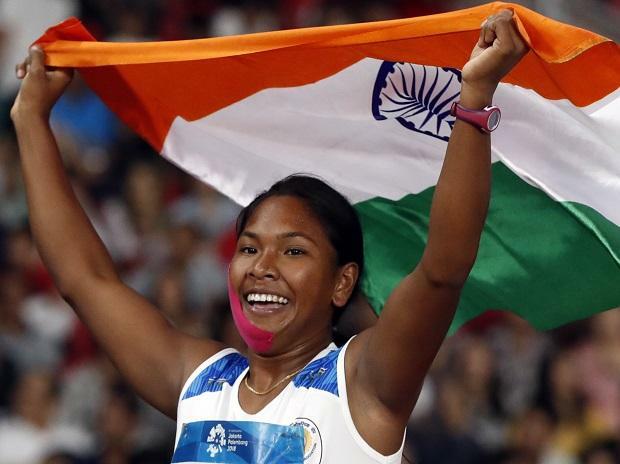 The first Indian heptathlete to win an Asian Games gold, Swapna Barman on Wednesday made a plea to provide her more customised shoes for her 'abnormal' feet. Barman, who has six toes in both her feet, produced her career-best performance on Wednesday by logging 6026 aggregate points from the seven events spread for two days. She competed with a tape on her right cheek to lessen pain arising out of teeth infection. Before Barman, only Bengal's Soma Biswas and Karnataka's J J Shobha and Pramila Aiyappa had returned with a medal from the Asian Games but none of them have won a gold. Biswas and Shobha had finished two-three at both Busan Asian Games (2002) and the Doha Games (2006), while Pramila had won a bronze at the 2010 Guangzhou edition. "I have got this gold on the National Sports day, so it's really special. I use normal shoes worn by people who have normal five toes. It really pains during training. It is very uncomfortable, whether I wear spikes or normal shoes," Swapna said with a smile. She said she also overcame a knee injury before the event. Asked if she would like some companies to manufacture customised shoes for her, she said, "Definitely. It will make life easy." At one time, Barman's father was a rickshaw puller and bed-ridden due to a stroke suffered. Her weakest events were 100m (981 points, 5th position) and 200m in which she finished seventh with 790 points. Going into the 800m run, the last of the seven-event competition, Barman was leading China's Qingling Wang by 64 points. She needed a good run in the concluding event in which she eventually finished fourth. It was the same event in which she had collapsed during the Asian Athletics Championship last year in Bhubaneswar but despite finishing fourth today, she had emerged a champion. Asked about the tape on her cheek she said, it was to lessen the pain in her teeth. "I used to eat a lot of chocolates, so I have a teeth problem. It started paining two days before the event. It was severe but I could not let years of hard work go waste. So I forgot the pain and gave my best," said the undergraduate, who is fearing for final examination result. "First day, I thought I won't be able to compete. It was unbearable. I thought what will happen to my hard work, I had to do it. I forgot the pain." Another Indian in the fray, Purnima Hembram was 18 points behind Japan's Yuki Yamasaki going into the 800m run. She finished just ahead of Barman in the 800m run and overall fourth with 5837 points. Qingling (5954) won the silver and Yamasaki the bronze with 5873 points.